Baselworld is just a few weeks away, and some brands have already started pulling back the curtain on their upcoming offerings. Whether the new models are revolutionary or tweaks to a successful formula, we are looking forward to seeing the full array of timepieces that are set to be released in Basel! First introduced in 1963, and quickly becoming a staple of the brand, the Carrera Heuer 02 has been redesigned from the ground up for 2018, affirming its penchant for avant-garde horology. The distinctive lines of the 21st-century Carrera line house a brand-new movement, the Heuer 02 caliber. It powers a classic chronograph layout: chronograph minutes at 3 o’clock, chronograph hours at 9 o’clock and small seconds at 6 o’clock, with central chronograph seconds and a date window at 4:30. Powering this display is an automatic manufacture chronograph, visible through the skeletonized dial and the sapphire caseback. A prime example of haute horology elements and industrialized production techniques, the Carrera Heuer 02 includes a column wheel and a vertical clutch among its 168 components. Zenith enhances and expands its Heritage Collection with the Pilot Extra Special Chronograph, a tribute to the pioneering aviators of yesteryear. 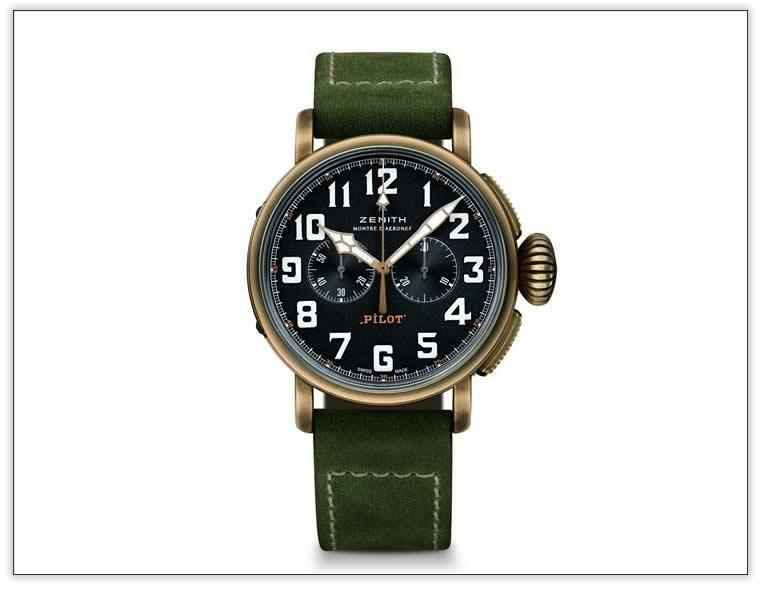 The bronze case adds a vintage feel that will only deepen as a patina develops. The new black dial, with a sandblasted finish, highlights the large, luminescent Arabic numerals, framed by a railway-style minutes track and sporting two chronograph counters. Within beats Zenith’s signature movement the El Primero Calibre 4069, providing precision to 1/10 of a second and a 50-hour power reserve. The solid titanium caseback bears an engraved image of the plane flown by Louis Blé riot when he crossed the English Channel wearing a Zenith on his wrist. 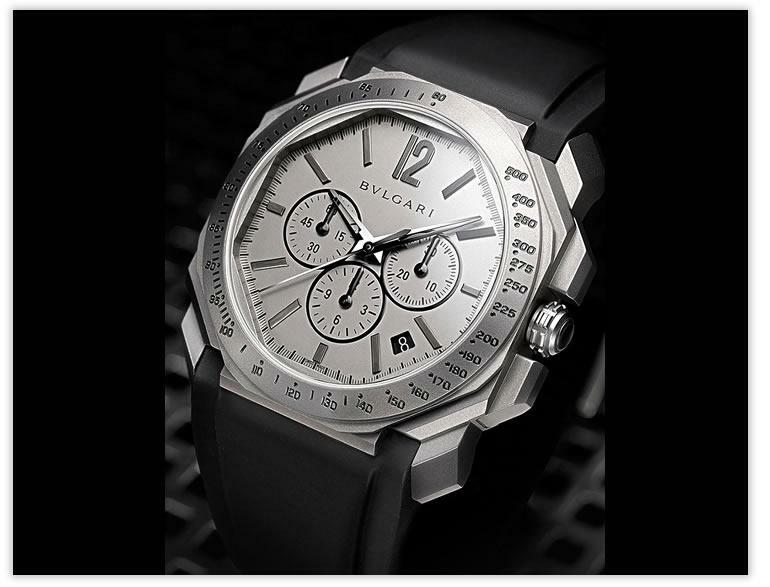 Bulgari’s Octo line has been a beacon of modernity since 2012, despite its classically inspired eight-sided dial. The Octo L’Originale Chronograph takes on the informative, even busy chronograph display and renders it impeccably elegant, using titanium to flatten the various levels to a single, cohesive shade. Often used in manufacturing aircraft due to its extremely light weight, titanium has expanded the boundaries of watchmaking with its resistance to corrosion, fire and mechanical stress. Here, it has the added quality of imbuing a machine-age case and chronograph dial with a soft-focused, hard-edged sheen. The model is powered by the BVL 328 Velocissimo movement, a self-winding column-wheel chronograph with silicon escapement.